I jumped on the Harry Potter wagon late...February of this year. Once I started, though, I was hooked. I loved the world Rowling created and her characters became beloved friends. I, like so many others, was really looking forward to the last book in the series....and I was not disappointed. This book is much more action packed than the others, yet still deals with the depth of emotions that Harry is facing. This includes his facing of death itself. As Dumbledore says, "Do not pity the dead, Harry. Pity the living, and, and, above all, those who live without love." Harry makes mistakes (don't we all), but he learns to trust others, stand for truth, and courageously put his friends ahead of himself. He selflessly lays his life down to save the world as he knows it. What a role model, not just for kids, but for adults, as well. And Snape, poor Snape. I love the quote from the last chapter, "...you were named for two headmasters of Hogwarts. One of them was a Slytherin and he was probably the bravest man I ever knew." We finally get to learn the truth about Snape, and he wasn't at all what he seemed. This book was an excellent ending to a great series. I feel a little sad that my travels with Harry have come to an end. But, I will probably revisit him in the future. First line, "The two men appeared out of nowhere, a few yards apart in the narrow, moonlit lane." Last line, "All was well." This book is a look at one man’s survival of a Nazi concentration camp. It’s a very small book with a very big story. This is a heart wrenching tale that should be read by everyone. The depravity of man is real, as shown by the atrocities of the Nazi’s. It is something we must never forget. Lady Susan is a flirtatious, beautiful widow who knows how to get what she wants. The book is set up as a series of letters and tells the story of Lady Susan’s search for a husband for herself and her sixteen year old daughter. She’s deceitful and vindictive, the kind of woman you want to avoid yourself, and definitely keep the men you love away from. I may have my sons read this when they are older, to get a good picture the kind of woman they need to avoid! All her plans fall around her. A very pleasurable read. Last line, “For myself, I confess that I can pity only Miss Manwaring, who, coming to Town and putting herself to an expense in cloathes, which impoverished her for two years, on purpose to secure him, was defrauded of her due by a woman ten years older than herself. Fifty Acres and a Poodle by Jeanne Marie Laskas was a look at the author’s (a city girl) move to the country. Her style is very conversational, although a little scattered. She’ll be telling a story, then something else will pop in her head and she’ll run with that for a while. Although this was annoying at times, I enjoyed reading this book, it was fun and easy. Her life on the farm is filled with ups and downs, but she finds herself through it all. We decided to start school while the kids were excited. So, following an exhausting week of VBS, we had our first week of school. This year we are using Winterpromise Animal Worlds, along with GTG, Sonlight's LA and Horizon Math. The first day went really well. We started the day by going out to breakfast at McDonald's. Then we came back and hit the books! 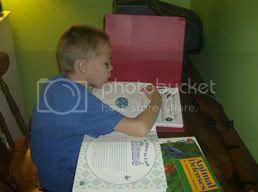 Caleb doing some of his independent reading. We decided the book he's reading here is still a little too hard for him to read on his own, so I'll be reading it as a read-aloud. The other books, though, he did really well with. Josiah and Rachel work on their Alphabet craft. We arranged the letter crafts to match Sonlight's LAK order. This week they learned the letter F. The both did a great job writing the capital "F". Here, they are making Fluffy F's. 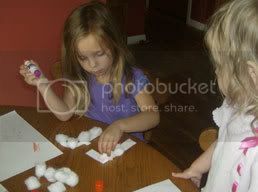 Jada glued cotton balls to a piece of paper (she likes to feel like she's part of things!). We only got one week in, and won't be doing any more school until the end of August. But, it was nice getting the first week under our belts. I think the kids are going to really enjoy the hands-on aspect of Winterpromise. We hosted a community VBS that involved 3 other churches along with our own. I was the director this year. We used Group's Avalanche Ranch, and had a great time (at least the kids did). We had around 70 kids, raised over 1300 dollars for an orphanage in Africa and had several decisions for Christ. 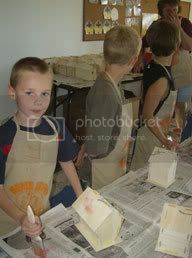 Caleb painting his bird house. Rachel sitting in the grass. She did really well the first 3 nights. Night 4 and 5, though, she would not go with her group. After questioning her, she said she was scared of a teenage boy who was helping in her group. "He does bad funny things," she said. Of course, my mommy radar went up! Upon further questioning she said he took her nose off! He must have been doing the whole nose-thumb trick....and Rachel thought he was really taking her nose off!! Josiah playing games. Jo also made a profession of faith this week, which we are very excited about! It was a good week....but a long week! Cynthia Voigt was a favorite author of mine in Jr. High School. I hadn't read Jackaroo, but it was as wonderful as the writing I remember from my youth. Gwyn is the daughter of the innkeeper, she is quick witted and sharp tongued. She has heard the story of Jackaroo since she was a child, but she always thought they were just that...stories. Then she finds evidence of his existence that changes her life. She discovers a lot about herself, and the world she lives in. It was a great read, that I highly recommend. First line, "Gwyn stood crowded in among the women." Last line, "But even as she said that, she could hear in her imagination how she would tell the tales to Burl, and how they would change in the telling." Snow flower and the Secret Fan by Lisa See was an excellent book. It is set in 19th century China and revolves around the live of a girl, Lily. The book shows a world so different than our own. I found the foot binding heartbreaking, yet fascinating at the same time. Lily is bound to another girl, Snow Flower, and they become laotong, or old sames. The book takes a close look at their friendship, including misunderstanding and betrayal. I highly recommend it! First line, "I am what they call inour village "one who has not yet died"-a widow, eighty years old." Last line, "Please forgive me."